When investing large sums of money into your future by way of building new or renovating, the biggest opportunity to create more value than you are spending is through good design. We know that ‘great design creates great value’ and those clients who have experienced this are quick to agree. Based at the end of Pukina Beach with stunning views out to the coast as well as the picturesque estuary, this section presented some very unique opportunities for our design team. While it was obviously important that we take in the best of both views, the client also wanted a small and efficient building which could be used as a weekend home. So many of our clients and industry partners have commented on our artistic renderings of their new building plans. So much so that we have decided to now make this service available to the general public. 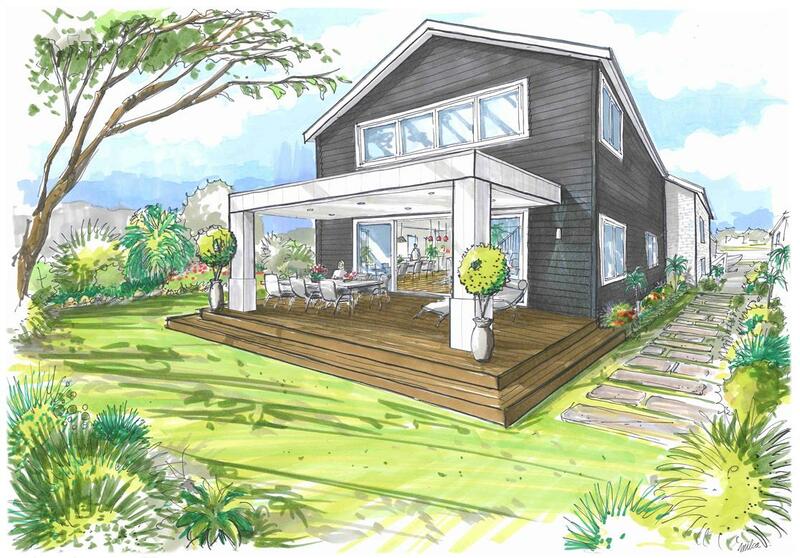 An artistic render, like the one shown below, can be produced from floor plans and elevations. This is great visual marketing for your home or commercial building, particularly where you may be looking to sell the property from the plans. Call us on 07-543-3030 or email us here to find out more.